This new release is focused on the mobile header, OpenGraph and the Portfolio extension. You can now choose to place your logo / cart / mobile link, more details below. 1. You can now control the image and summary width in your single products. 2. 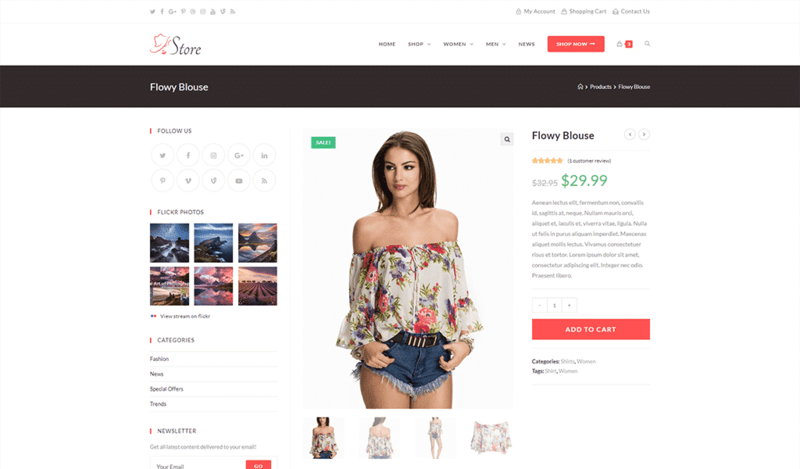 A new setting is added in WooCommerce > Single Product to select between three styles for the Add To Cart button, normal the button as a normal size, big, the button is bigger and very big, the button takes all the summary width. 3. A new style is added for the cart icon in the header, the style is exactly the same as you can have with the woo cart shortcode, so now you can use the shortcode and have the exact same cart icon on mobile view. 4. A new style for the tabs in single product, now you can display them as sections without any tabs links. A new settings has been added for OpenGraph in the General Options > General Settings section of the customizer. When you will share a link of your site on your social medias, the meta tags will tell them exactly what to take. On the upcoming Elementor Pro 2.0, you will be able to customize absolutely every parts of your website, archives, single post, taxonomies, etc..
OceanWP is fully compatible with all the new Elementor 2.0 features. Some new great features have been added to the Portfolio extension. 1. It is now possible to choose to enable/disable the link and lightbox icons. 2. You can enable a setting to open the item image in a lightbox to the image click. 3. The lightbox script is replaced by PhotoSwipe, this new script is much better and has great features like full screen, social share, better looking, etc… This script is perfect for photographers to showcase your work in a beautful lightbox. 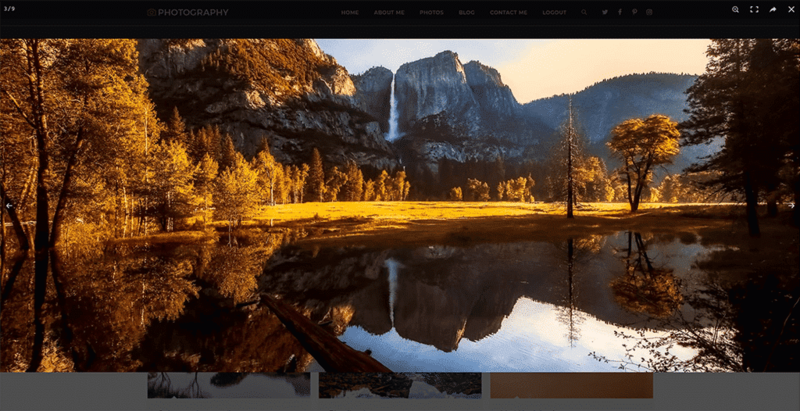 You can check the new lightbox in live in the Photography demo. 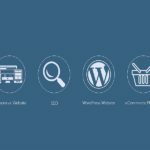 OceanWP is now fully compatible with WooCommerce Germanized. A new setting has been added in Typography > General to disable the Google Fonts. The issue of the color picker settings in the customizer and the OceanWP Settings metabox with the Safari browser is now solved. 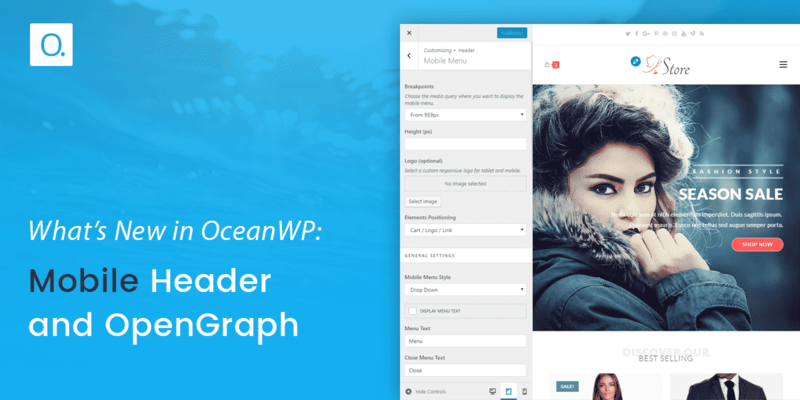 A widget is added in the WordPress dashboard to display the last OceanWP News & Updates so you will be able to see the latest news of the theme. The licenses tab is removed from Theme Panel and is added is a new page, when you will activate a premium extensions, the Extensions tab under Theme Panel will be replaced by Licenses. Two new check boxes settings has been added to the White Label extension to allow you to hide the OceanWP News & Updates widget in the dashboard and the sidebar in Theme Panel. 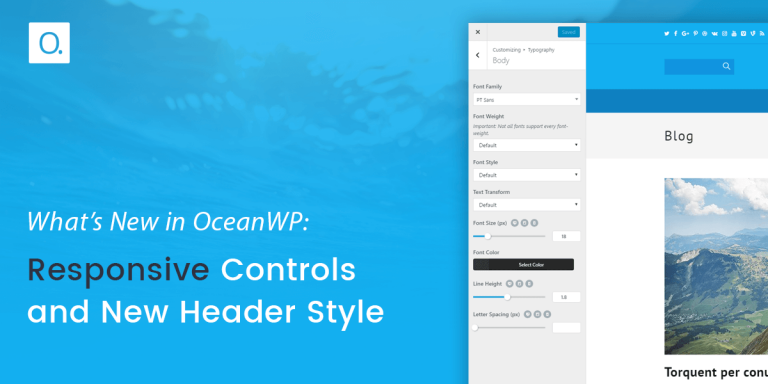 Tell me in the comments what you think about this new update and what you would like to see incorporated in OceanWP in the future. Big Update of Ocean Elementor Widgets is Here! The mobile menu is now above my normal header and kind of disturbs everything. How can I remove it? Other than that it all looks good. Hello, have you cleared your cache? Hello, thank you very much for the support! 1. In the desktop version, the menu appears duplicated. 2. In the mobile version I see the entire menu aligned to the left and there is a white space to the right. I hope you can help me please. Hello, have you cleared your cache? Also, if you have disabled any scripts, go to Theme Panel > Scripts & Styles, click Save Changes, then clear your cache. Same for us. We’d hoped clearing the cache would work but it didn’t and we ended up reverting the site back to a previous state with the last version of Core Extension Bundle. Hello, it is just a cache issue, if you have disabled any script, go to Theme Panel > Scripts & Styles, click Save Changes, then clear your cache. I’ am using a child theme, could this be the reason for the problem? Thanks Nicolas! This update is very cool! 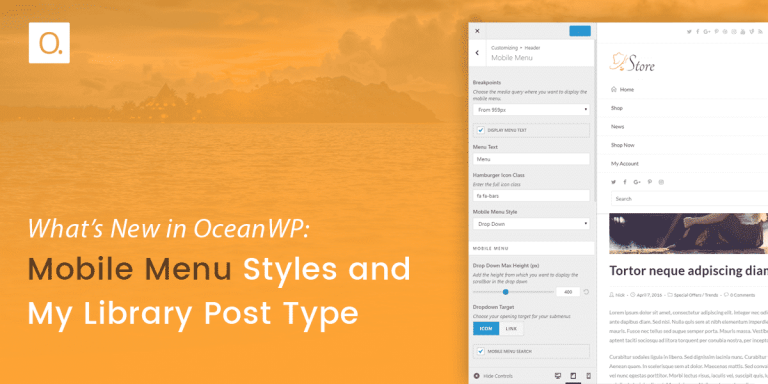 OceanWP is the best theme. Thanks you so much for your work. Very glad that you like it. Hello. After updating tonight, elementor is giving me the ‘Preview Could Not Be Loaded’ Error when trying to edit a page. I’ve cleared cache, and have saved permalinks as new format. Elementor works fine when i activate another theme. My site only show header now since pages and footer were made with elementor. Any ideas on what i should try? Hello, can you update to 1.5.7 and tell me if you still have the issue? Yes! Thank your for your speedy response. And thank you for oceanwp. Hello Nicolas, After the update its giving me this error. Fatal error: Call to undefined function oceanwp_wcmenucart_menu_item() in /home1/manueloconde/public_html/wp-content/themes/oceanwp/inc/header-content.php on line 160. The only way I can edit with elementor is if I disable “Display Header”. By doing so I lose my menus. Thank for your help.I tried to update it again (ver. 1.5.8) and finally it works. It looks to be a problem with “WP Super Minify” and “WP Super Minify”, these plugins didn’t erase completly the saved cache. The only visible change after update has been the search field beside the website logo, what i have fixed without problem. Great job! I love this WordPress theme since i was noticed about months ago! Despite cleaning cache and try disabling-enabling other plugins, after this last update, my website has broken. Currently i use Elementor. Before this version, every was fine. I’m using 7.1 PHP version. What’s wrong? big problem with this update, my site is empty, we just see the menu and the logo. There is also the search bar that is displayed, yet I had disabled it, with this new update it is displayed. I’ve got the search box showing up in header too. Did you find a fix? Après avoir installé la dernière MaJ, Le menu Hamburger apparaît systématiquement sous le menu principal et je n’arrive pas à empêcher l’affichage. En mode tablette et mobile, l’affichage est normal. Bonjour, videz votre cache. Et si vous avez désactivé un script, allez dans Theme Panel > Scripts & Styles, cliquez sur le bouton pour sauvegarder, ensuite, videz votre cache. Nicolas. this new update is great. but i am having some problems. after this new update, the menu button positioning on mobile phones is not good, and the menu button is also show up on desktop. please fix it. it’s solved. sorry for the first comment, i was frightened. first i purged cache of w3 total cache nothing happened. then i purged cache of ”fast velocity minify” plugin, which is a minify plugin then it’s solved. you’re theme is great. I have a question, would u suggest me to use fast velocity minify plugin, it is giving me better results in pingdom, gtmetrix and google page speed. use wp rocket, it’s the best! I can’t possibly put to words how grateful I am for such a brilliant theme for free so please know that I am not nagging but giving some honest feedback. Since the new update the mobile menu shows up on desktop and the cart icon on it is duplicated and the menu doesn’t even show up on mobile itself. I hope you can find this information useful. For your issues, have you cleared your cache? Also, if you have disabled any scripts, go to Theme Panel > Scripts & Styles, click Save Changes, then clear your cache. Thank you for your reply! Before I tried your suggestion, it seemed the issue with the mobile menu showing on desktop had resolved itself somehow but I still get duplicated cart icon+number of items on mobile. My header style(header>general>style) is set to medium. Before when I said I see no menu on mobile, the header was set to top menu. I’m going to work around this with some tweaking somehow until a fix is available. All the best! Please I have issues with my Wp Ocean store theme. After updating, I noticed that main menu displays both mobile and desktop menu on a desktop computer. Hello, it is just a cache issue, have you cleared your cache? Also, if you have disabled any scripts, go to Theme Panel > Scripts & Styles, click Save Changes, then clear your cache. Have you a cache system on your server or are ou using Cloudflare? You need to clear all the cache of your server/site and that will update the CSS file with the right code. Yes Masonry works, on the screenshot you sent, your images are the same size so you cannot see but if you add an image to a different height you will see that the masonry work. I am posting a new comment as I’ve encountered a new issue with version 1.5.8.. It appears the new update causes a conflict with Woocommerce or vice versa as the customize function stops working. I checked have all other plugins and it seems it’s Woocommerce and a pretty major one tbh. I hope you guys can use this feedback. Hi, what is the issue? Hi. I noticed that the customize function stopped working suddenly as it didn’t load completely to show up. It freezes showing “customize – loading” on the tab in chrome and shows only widgets as an option but they can’t be adjusted. I might be mistaken but I disabled all plugins and tested them one by one and enabling Woocommerce is what seems to cause the problem with customization of the theme. Hi Nicolas, thanks for the update 🙂 unfortunatley I have the sme problem as mentioned before here! After updating the mobile menue and side panel icon show up in the header. Hello, it is a cache issue. If you have disabled any script, go to Theme Panel > Scripts & Styles, click Save Changes, then clear your cache. I’m having the same issue as others have mentioned. I can’t get the mobile menu to go away (even after deselected and reselected scripts and clearing the cache). Now the mobile menu won’t work, so mobile users can’t navigate at all. Products quick view not working after update. Hello, create a support ticket and send me your site url. 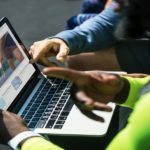 Besides Yoast SEO and LiteSpeed Cache plugins I’m using free Elementor and Jet Elements (http://jetelements.zemez.io/). Hello, can you send me your site url? Disable LiteSpeed Cache and tell me if you still have the issues. I’ve disabled the LiteSpeed Cache but no luck. It is an issue with Elementor, you will need to contact them. 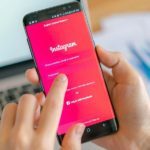 Is there any way to add more than just the social media buttons to the Medium Header Style? I read that there was gonna be an update to add more than just the social feed. I wanted to add some text there with something like business hours and an email address. Hello, I try to do something for a future release but you can create a custom header so you can do what you want. Would appreciate if i could get some help to resolve this problem. This problem appeared after the latest update. Hello, can you open a support ticket for this? I will need more information. Thank you. Click the Support link in the menu. If you are not a customer, open a pre-purchase ticket because I will need personal information. Hi Nicolas, thanks for this wonderful theme. I’m trying to use the Pagescroll to id plugin but it doesn’t seem to work with Ocean WP. How can I fix this? Hello, you will need to contact the plugin author if there is a conflict. I will I guess subscribe to your yearly support, I would like to know if the yearly support includes all your plugins and widgets? or shall I purchase this separately. Also, what is the difference from your monthly plan and the yearly support? last question, in our website https://www.kaaraba.com/product/doble-lcm500/ we have added a modal box which display a form when you click on the icons ” ?’ ask questions, as you can see the customer could select a calendar , but the calendar is not displaying on the modal box, do you know how to fix this please? Hello, no, the priority support doesn’t include the premium extensions. Nicolas, you are the best !!!!! and it did worked well !!! The categories of the entry have disappeared. At first you could see them with their content and their image. Not now. How can I get them back? What should I play? Hello, can you open a support ticket, and show me the issue? Hello Nicolas .. absolute love the OceanWP theme and plugins .. Very easy for newies like me 🙂 .. but unfotunate the latest update of Oceans Extra is screwing up my menu’s .. If I delete the plugin all looks fine but then I can’t edit looks of the pages [like margins and such] .. Reinstalling the plugin does not help .. So if you have an advice here in settings to make it look normal again I would appreciate big bunch! Hello, can you open a support ticket and send me your site url? Great post. Interesting overall. Great features added on oceanwp. Mainly the opengraph mobile header feature. Parse error: syntax error, unexpected T_STRING in /home/content/37/10406937/html/lucas/wp-content/themes/oceanwp/inc/third/class-elementor.php on line 309. Receiving this error after installing Oceanswp on my website. I am using the latest version of Worddpress. Any idea’s? Please email me at [email protected]. Hello, it is because you are using a very old PHP version, upgrade to PHP 7 and that will solve the issue. >>the menu #1 shows on desktop. >>Random Menu #5 shows on mobile. Hello, can you open a support ticket, please? How to u add more elements to the header general options? I don’t want such limits. I cant believe there is no option to add a simple text block! I have to keep modifying the header search file to add simple text to the header instead of search/social profiles. 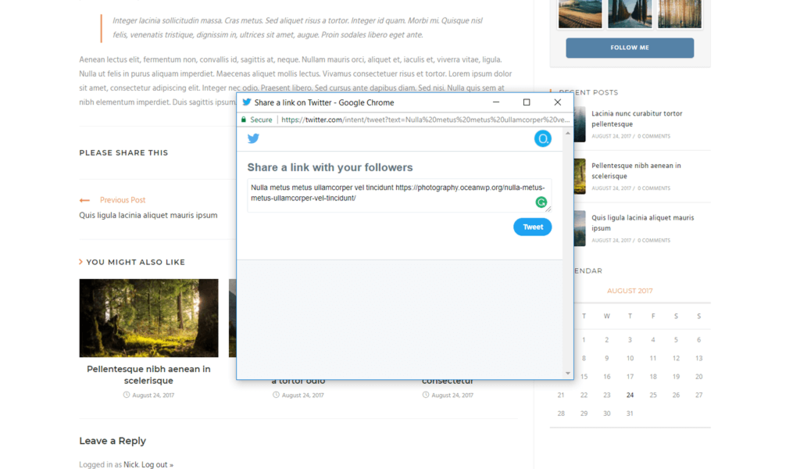 Hello, the header/footer have no limits because you can create a custom header and footer so you can do absolutely what you want. Hello can you open a support ticket please? I will tell you how to do. I’m not sure what to make of this theme. I’m trying out the free version on a test site. However, the mobile menu problem, raised some time ago I can see now and still on-going for many, remains unresolved. I have disabled all of the plugins, removed custom css, changed the width at which the menu displays, deleted cache – in fact all of the suggestions I can find – but no joy – on Android anyway. It’s such a major issue. I wouldn’t dream of purchasing premium based on this experience. Hello, all users with this issue have been resolved, can you open a pre-purchase ticket and send me the login details of an admin and FTP account? I will solve this problem for you. Hi Nicolas. Merci pour ce thème complet. I have a different logo on each device. I have changed it for the mobile through en tête > menu mobille. But I can not change it for tablet. So I have a logo for desktop + mobile and a different one for tablet. May you have a solution ? Hello, go to the Header > Logo section of the customizer and add your own logo in the Retina Field, tell me if it solves the issue? Hi, Is it possible to show the site logo on the mobile menu? Hello, you probably mean for the sidebar style, by default, it is not possible but you can hire a developer to do it for you.